The T-64 had a some what short career with the Russian Ground Forces. It wasn’t designed to be exported to WARSAW states like the T-55, but was more intended to be a technological tank to be used by more elite tank units. A chap called Alexander Morozov designed the vehicle and it entered production at the Malyshev Factory in 1963. 1. It was the first tank to use laminated armour, that is a non steel ceramic material tile that offers an increased protection over steel and is then sandwiched between two plates of steel, thus reducing the weight of the vehicle without the loss of protection. 2. It was the first tank to use an autoloader, which reduced the crew to three, gunner and commander in the turret and the driver in the front o f the hull. The autoloader was fed by a carousel. 3. 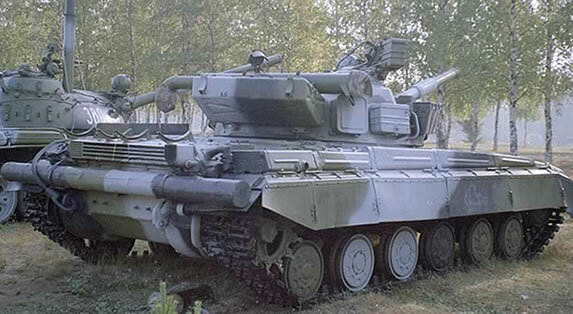 The original T-64 entered production in 1963 with the same 115mm main gun as used on the older T-62, however an Iranian Officer defected to the Russians with a USA M60A1, which the Russians evaluated and resulted in them replacing the existing 115mm with a new larger 2A46 125mm smoothbore, which became the standard for all future Russian tanks. 4. The vehicle used a 5DTF 5-cylinder diesel engine, which generated 700hp and provided a top road speed of 60km/h. However the engine had a number of issues and proved unreliable compared to other successful Russian engines. It with a new type of suspension and running gear and offered greater mobility compared to other tanks so that it could keep up with the new BMP-1 Infantry Fighting Vehicle. The 125mm main gun fires several rounds – including APFSDS, HEAT-FRAG AND HE-FRAG. A total of 36 rounds can be stored in the autoloader and vehicle. Rounds are first loaded in to the main gun and then the combustible charge behind that. It can maintain a rate of fire of 8 rounds per minute, however as the autoloader ages, this would have decreased. Due to the vehicles low height, the main guns elevation is limited in comparison to Western tanks and is -6 to +14 degree’s. This causes problems in built up areas at firing at targets on upper floors of buildings as witnessed during the First Chechen War with the T-80. When wanting to fire at greater ranges, any main gun is elevated to +. This means the T-64 would have issues obtaining the same ranges a Western tank would have firing standard tank rounds. The vehicle is equipped with a coaxial 7.62mm MG (1250 rounds store) and a 12.7mm MG mounted on the commanders cupola (300 rounds stored) which gives it a Anti-Aircraft capability. The driver sits in the centre of the hull at the front. The commander sits in the left of the turret and the gunner on the right. The space between them is occupied by the main guns breech and the loading mechanism of the autoloader. The vehicle has an NBC protection system. The whole crew have infa-red night vision equipment. The vehicles basic range is 500km, however this can be increased to 700km when two external drums are equipped (both at the rear). T-64: Original model, no thermal sleeve for 115mm main gun. 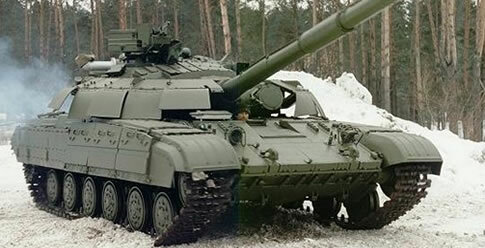 T-64A: Principal production model, which was built from 1967 onwards. Smoke grenade dischargers either side of the main gun. Side skirts added and new 125mm smoothbore main gun, with a new stabilizer (the 2ft-23). Other upgrades included a new hood and improved cooling system. In 1969 – new external storage was added. In 1972 – new sighting equipment was added as was a replacement 12.7mm MG. In 1975 – a thermal sleeve was added to the main gun and the engine was modified to a multi-fuel. T-64B: Entered production 1975, had a new 2A46-2 main gun that could fire the Lenkgranaten / Rocket. This had a range of 4000m. Fire control system upgraded with laser range finder and wind sensors. T-64BK: Command variant of the T-64B. T-64R: Between 1977 and 1981 years, almost all T-64’s were overhauled to the T-64A. The overhauled vehicles were designated the T-64R. T-64B1: 1984 – Simplified version of the T-64B Without the ability to fire the Lenkgranaten rocket. 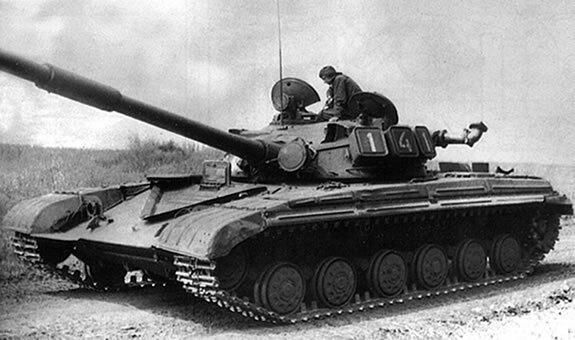 T-64BV: 1985 – Fitted with ERA armour and new radio communications station. Productionhas ended. Estimates of numbers built vary from 8800 to 16000. It was replaced in production by the T-80. Its not fully clear how many are still in service with Russia, but it is also in service with Uzbekistan. T-64BM2: 1999 – Motor 5TDF-M 850ps. Lenkgranaten launcher 9K119, FLA 1A43U, Automatic charger 6ÄZ43. T-64U: 1999 – Motor 5TDF-M 850ps. FLA 1A45 resembles (the devices in the T-80UD and T-84) Anvisierungskomplex PNK-4SU consists of: Commander-optic TKN-4S “Agat” Flag MG optics PZU-7 and Anvisierungsgerät 1ÄZ29. The commander can fire the weapons. Kontakt-5 reactive armour added. The vehicle was used by the Russian Ground Forces in the 1st Chechnya War.